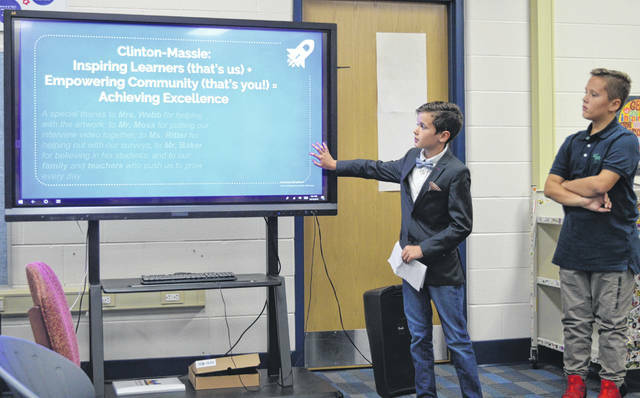 Calm and assured fifth-grade student Danny Mefford speaks while changing what’s on the touch-screen during the presentation “Be the Inspiration: Clinton-Massie Students want to Soar”. Next to him is fifth-grade classmate Jace Pittser. 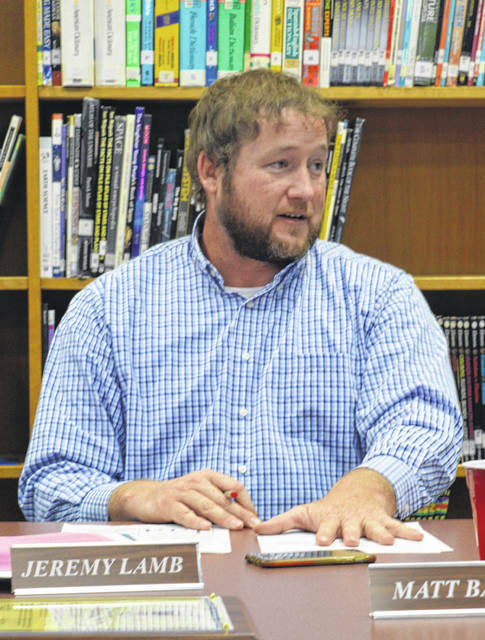 Clinton-Massie Local Schools Board of Education President Jeremy Lamb said he wants to make sure people have facts when they make their Election Day decision. 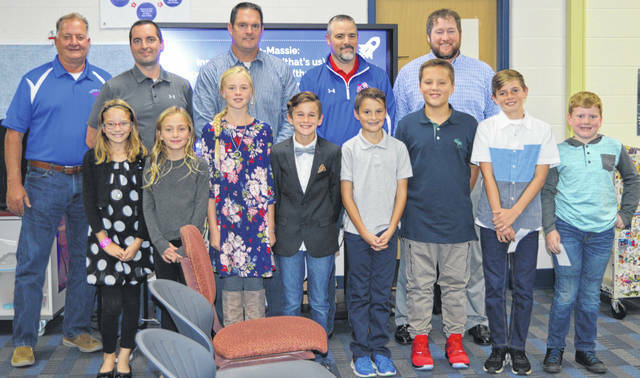 The front row is comprised of gifted fourth- and fifth-grade students who gave a presentation to the Clinton-Massie school board. From left in the front row are Kenzley Gale, Julia Reardon, Ellie Smith, Danny Mefford, Daniel Norman, Jace Pittser, Isaac Young and Cole Glidewell. Also part of the group that put the presentation together but are not present: Quinn McCoy and Gwenna Probasco. From left in the back row are board members David Webb, Chris Harrison, Andy Avery, Mike Goodall and Jeremy Lamb. ADAMS TOWNSHIP — Holding a red-tipped marker, the Clinton-Massie school board president said he wanted “to correct the record” as found in a leaflet against a proposed earnings tax and dropped off at district homes. Clinton-Massie Local Schools Board of Education President Jeremy Lamb said that in the past the board has not responded to similar things, but this time he wants to make sure people have the facts when they make their ballot choice. The school board is proposing a 0.5 percent (½ of 1 percent) earned income tax rate for the purpose of current expenses, with the tax question to be decided in about three weeks. The distributed flyer says it is “Paid for by Private Citizens”. Some information in the flyer is false or misleading, Lamb said at Monday’s board session, while some of it is true — though some correct information is used in comparing apples with oranges rather than with other apples. The leaflet’s numbers to support its claim of declining enrollment in the school district does not include open-enrollment students, said the board president. In another case of what Lamb described as the flyer’s misinformation, the person gathering the information apparently is not aware that the way a school district’s revenue is reported on a state website is different today than how it was reported formerly, said Lamb. The flyer is correct in stating that in 2017 Clinton-Massie opted to pay 100 percent of employees’ vision insurance as a new benefit. But Lamb said the flyer doesn’t mention a relevant fact: Clinton-Massie did not give as much of a raise in teachers’ base pay as a lot of other school districts were doing, and through adding the vision benefit, the cost to the district was roughly $30,000 as opposed to a full 1 percent increase in base pay costing about $100,000. Employers who want to be fair to their employees will try to provide competitive benefit packages, Lamb added. The district has been “more than lean” for quite a few years regarding teacher salaries, according to Lamb. The teacher salaries are “well within the norm” for area school districts, the board president said. Lamb recited the leaflet’s claim that Clinton-Massie has more administrators per pupil than the average for 19 similar districts. However, he said what taxpayers really should be looking at is the dollar amount that’s going toward administration per pupil. The Clinton-Massie dollar amount for its administration per pupil is $996, compared to $1,279 for the 19 similar districts referenced in the flyer. After Lamb makes his red-marker changes to the leaflet (on his own time, he emphasized), it’s anticipated the marked-up version will be posted and shared on social media. • Middle School Principal Joe Hollon reported attendance in the building is at 97 percent. In one activity, students greeted other students with a “hello” as they stepped down from their bus and, if they responded with a “hi” of their own, they received a Hershey chocolate kiss. It caught on, the principal noted. • Fifth- and fourth-grade gifted students gave a presentation titled “Be the Inspiration: Clinton-Massie Students want to Soar”. It included an interview video, results of surveys conducted of elementary students, and of course the students oral presentation itself delivered in front of the school board members and an audience of their families.